The Portland-based bank hopes to bring 1,600 jobs to South Carolina by 2016 as part of a large expansion effort. COLUMBIA, S.C. — Hiring for TD Bank’s expansion plans for South Carolina is ramping up as its Greenville customer call center opens next month with 70 people. The call center is part of the bank’s plans for a regional hub, announced last November. Bank officials say the center will employ about 260 workers by year’s end and 550 employees once fully staffed. They are among the 1,600 jobs the bank expects to add in South Carolina by 2016 — 1,400 at its expanded corporate offices off Interstate 85 and 200 jobs at a technology center in Lexington. The bank currently employs 1,465 people statewide. TD Bank President and CEO Bharat Masrani said the “real activity” in hiring will be at the end of this year and next year. Its parent company, Canada’s Toronto-Dominion Bank, acquired financially troubled, Greenville-based South Financial Group in 2010, adding 176 locations in the southeastern United States. Last month marked one year since all signs at the 103 Carolina First branches across the Carolinas were converted to TD Bank, including 77 stores in South Carolina. Masrani described the past year in South Carolina as very positive. Renovation is underway at the bank’s Greenville campus and will continue through December. Its three buildings, totaling 300,000 square feet, were essentially empty when TD Bank bought South Financial. Call center employees will move into their permanent space there in January, said TD Bank spokeswoman Rebecca Acevedo. Minor renovations at its Lexington center will continue through November, she said. The Greenville campus is TD Bank’s third hub. The company’s dual U.S. headquarters will remain in New Jersey and Maine. The bank has not added any branches in South Carolina and has no plans to do so. Masrani said TD’s locations appear to be well distributed, but refurbishing is underway. Masrani’s goal is for TD Bank to become one of the top three banks in South Carolina. It now ranks fifth, he said. He touted the bank’s philanthropy, saying TD realizes that “the communities we operate in need to be successful.” The bank’s nonprofit has doled out more than $480,000 so far this year in grants and sponsorships across South Carolina. South Financial was the subject of Federal Reserve enforcement action in May 2010, after the bank had suffered more than $1.3 billion in losses since 1998 because of loan charges related to real estate. Later that month, TD Bank Financial Group Inc. announced it was buying the company for $192 million. South Financial operated under the Carolina First and Mercantile Bank brands in the Carolinas and Florida. All signs were changed to TD Bank in June 2011. The company plans to consolidate call centers at its hubs in Maine, New Jersey and South Carolina. 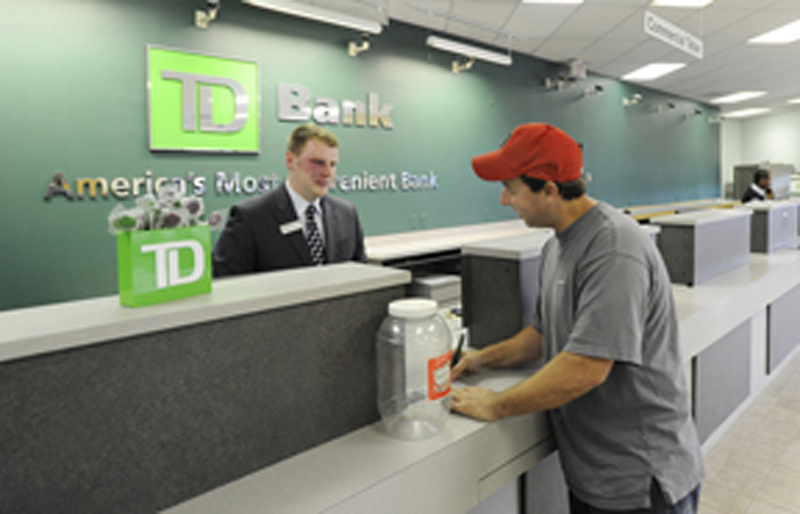 In May, TD Bank announced plans to lay off about 200 people in Springfield, Mass., as it closes a 24/7 customer call center there in December.